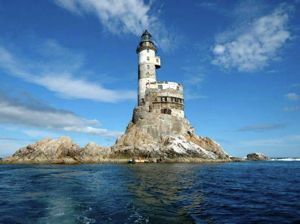 The Aniva lighthouse was built by the Japanese in 1939, on a chunk of rock off the southern coast of Sakhalin, a thin 950 km long island situated just east of Russia, between the sea of Japan and Russia’s Sea of Okhotsk. 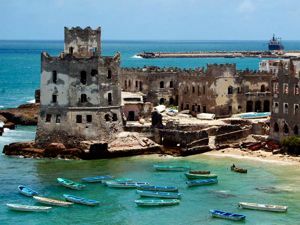 The island was largely uninhabited until the 1800’s, when both Japan and Russia became interested in annexing it; the Russians for use as a penal colony. Almost a fairy-tale castle on the water. That led to years of conflict, retrenchment, and buildup of military forces, with both nations agreeing to split the island across the 50th parallel. 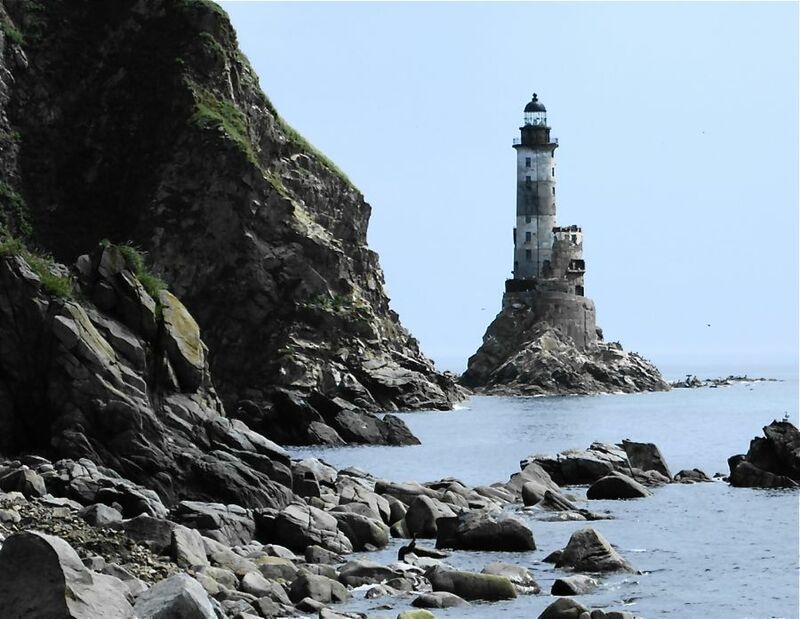 A ring of light-houses were built on Sakhalin’s rocky coast to signal incoming troop carriers and merchant ships. 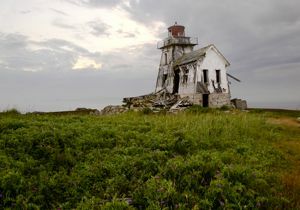 After around 50 years of sharing the island, the Russians annexed it all in the Second World War, causing some half a million Japanese to be evacuated back to Hokkaido. 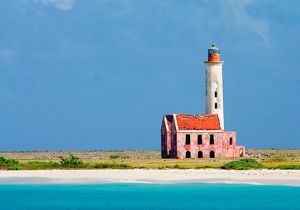 In 1951 the Treaty of San Francisco was signed, officially handing tenure of the island over to the Russians, though plenty of territorial issues remain over surrounding, smaller islands. A dangerous and rocky approach. 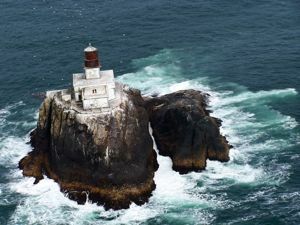 Building the lighthouse required extensive blasting of the rock it sits upon to make a level surface. Now rusted and swarmed by gulls. I read about this location first on English-Russia. 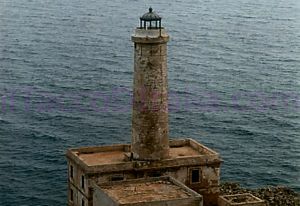 There are interior photos taken by an urban explorer claiming that the lighthouse was radioactive, having been powered by a small nuclear unit that had breached. Though looking at the size of the structure and the total lack of evidence elsewhere on the net (that surely a breached nuclear site would attract), I rather doubt its true. It is dramatic though. Apparently this reads Radioactive. Surely someone’s idea of a joke. 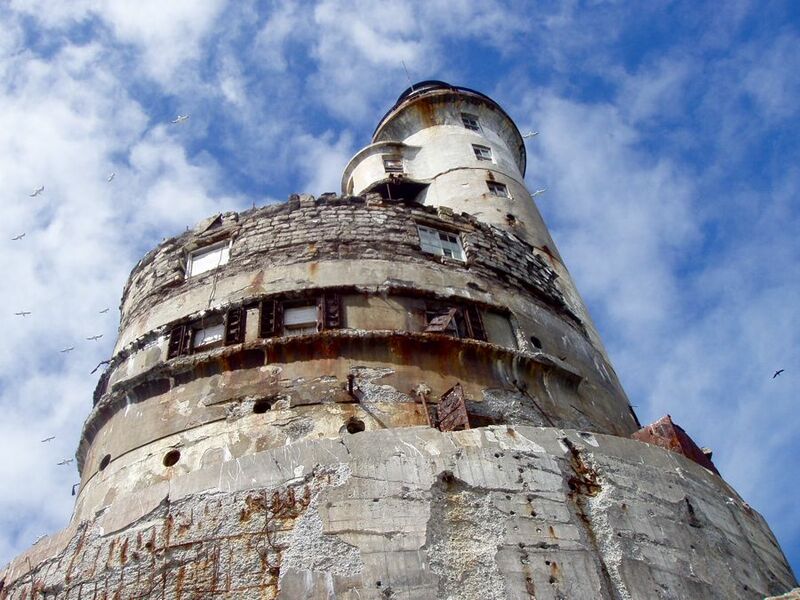 Weird idea making a lighthouse that is nuclear powered, I guess a holdover from the days when the Russians wanted everything to be nuclear, and maybe didn’t really understand the environmental consequences like we do today. 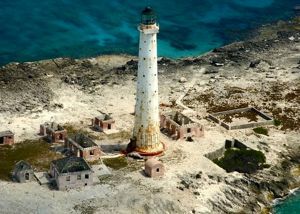 I think the charm of an nuclear lighthouse was that it would provide the automated station with power for years or decades without visits for refueling. Fine in theory, but obviously you have to commit to occasional visits for ordinary maintenance to keep the unit running safely. Really? And you know this to be true how, exactly? Can- Probably the Russians didn’t care about nuclear damage. I imagine them to have been on a war footing basically all this time, caring only about getting things done and showing force. Nuclear automation would have no doubt appealed. 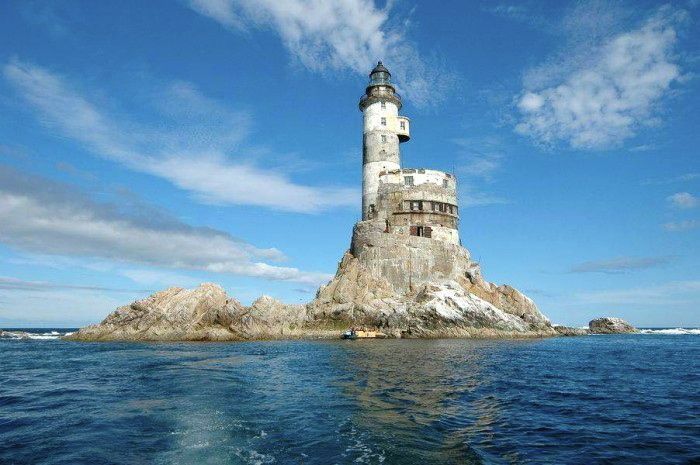 David- After they stopped rowing over Sakhalin island with the Japanese, probably the need to send ships there diminished, so the need for light-houses diminished too. That’s my theory. Bob- I don’t know about the over-arching meta-narrative, but am glad you liked the piece. Parabellum- Short of going there myself with a rad-suit and Geiger counter, I’m not sure how I could really know it to be true. I read it on various web-sites and went with it. It sounds cool. Ignore the barb and Parabellum’s question is a fair one. I, for one, would not want to tangle with atomic-casement-splintering vandals. You might be able to use them in a story, though, Mike. David- I wouldn’t want to tangle with them either, they’d probably be all messed up like the Toxic Crusaders. google http://www.bellona.org/. it’s all too real. the russians are oddly flippant about nuclear concerns. the lighthouses are the least of their sins, but we in the U.S. only are outraged about the evils of plastic shopping bags. cut the crap, people! 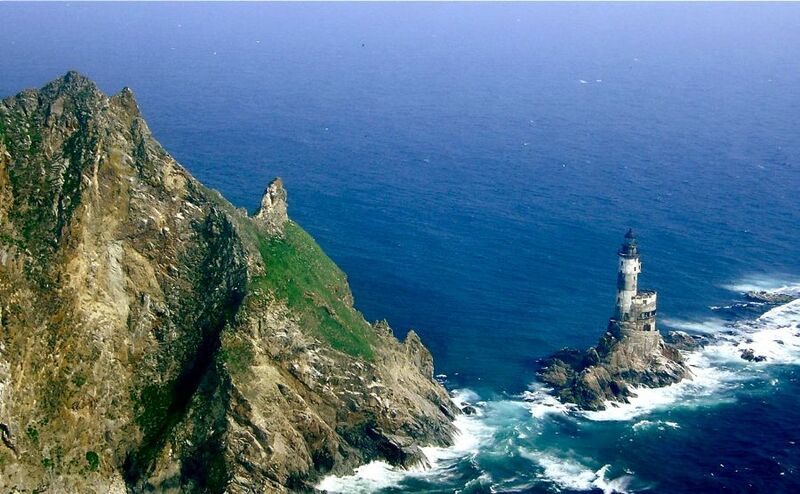 been there myself and never seen this lighthouse. if it was true this would be known by people, spread by media, etc. to me handwritten word “radiation” only means smbd pulled a nice joke… we need facts, right?! Steve- Thanks for wading in, great to have your input. atomic-casement-splintering vandal- You’ve been there, and never saw the lighthouse. Hmm. 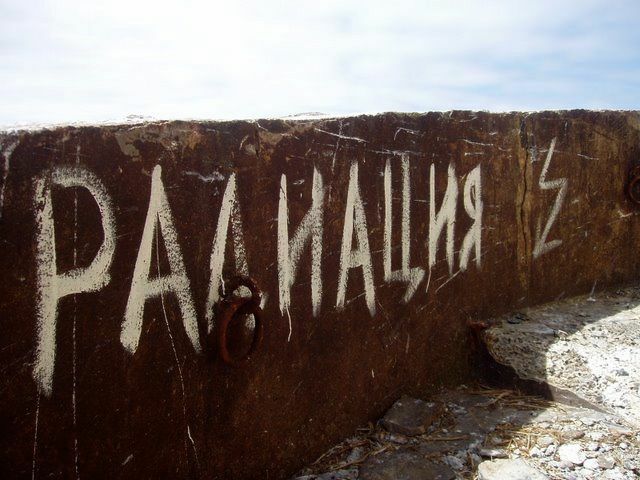 You toured every crag off Sakhalin? Seems unlikely. Check the image links and see multiple sites referencing it along with details. All made up? I think it be very interesting to go back with geiga counter to see how unsafe or if its unsafe at all. i have great interest in RTG and your picture are perfect for an exposé ! 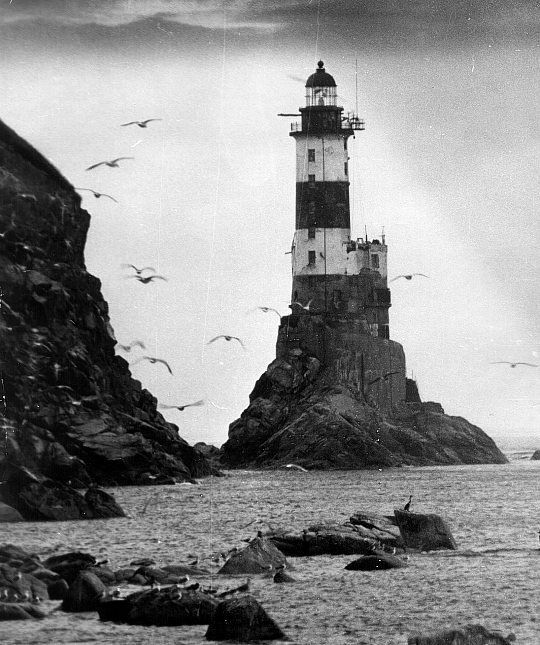 the gray scale pitcure remenber me some phantomatic lightouse ! sj- I wish I could take credit but these pictures are sourced off the internet, various sites, see the embedded links. 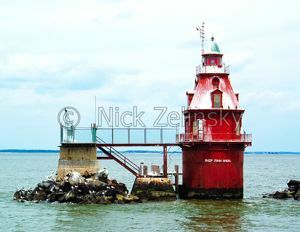 I think the best abandoned lighthouse ever is the Morris Island Lighthouse off Charleston SC. It is majestic and ever changing with the tides and seasons. It should be on your top 10 list. 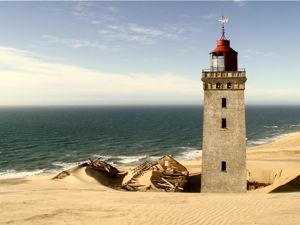 Anyone know the coordinates for the lighthouse? I found an article that gives them but they were incorrect. 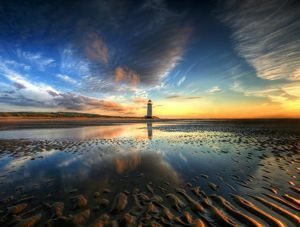 for lighthouses and think they are majestic. Would love to live in one.